KotyKatz Latvia is a beautiful brown rosetted Bengal with a wonderful pattern and jet black outlined rosettes. She also has a very wild look which I love! She is loving and active, full of wonderful Bengal character. Her parents are Tecspot Riders On The Storm & Bengalglitz Lollipop. If you’d like to see Latvia’s pedigree, please click here. 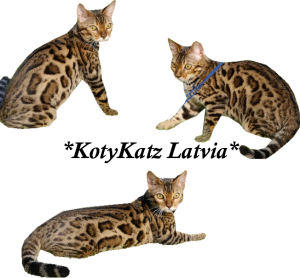 This entry was posted in Gallery, Reference Queens and tagged Bengal, Bengal Queen, brown rosetted, rosetted bengal cats. Bookmark the permalink.